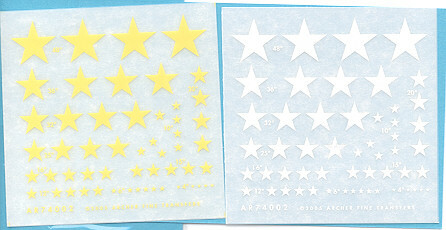 This new set consists of US stars in either white or yellow for 1/72 or 1/76 military vehicles. Then come in a variety of sizes including 10", 12", 15", 16", 20", 25", 32", 36" and 48". These will be useful on just about every US military vehicle except for the Sherman. Apparently they used something different in terms of either size or design. Regardless, these are top quality dry transfers for your next small scale military vehicle and best of all, no worries about silvering!